Condo Culture | Gobble, Gobble, Wobble, Wobble. William Arthur Ward once said that gratitude can transform common days into thanksgivings, and we couldn’t agree more. Thanksgiving is a time of love, togetherness and gratitude…plus pumpkins, more pumpkins, pumpkin pies, pumpkin spiced lattes and perhaps some stunning pumpkin coloured flowers too. In fact, it’s such a beautiful occasion, we take it one step further by beautifying our homes with seasonal colours and accents. Leaves, branches, pinecones and (dare we say pumpkins once more) often make the décor list. If you’re the master chef cooking up a storm and hosting this year’s Thanksgiving Dinner, you’ll like what we’re about to share with you. With Thanksgiving around the corner, it’s time to start planning your holiday table decor arrangements! We’ve done some digging and scoped out sweet Thanksgiving tablescapes that we know your family and guests will adore! We’ve selected our fave 10 table arrangements and tips for today’s blog. If you want to learn more about DIY table settings and would like to check out some more tablescapes that not only compliment the occasion but the season, click on the source link found on the bottom of this page and away you go! Alright, let’s get started! 1) Decorate with Pumpkins: Select light and bright table decor such as white pumpkins to create a beautiful fall arrangement that your guests will love. 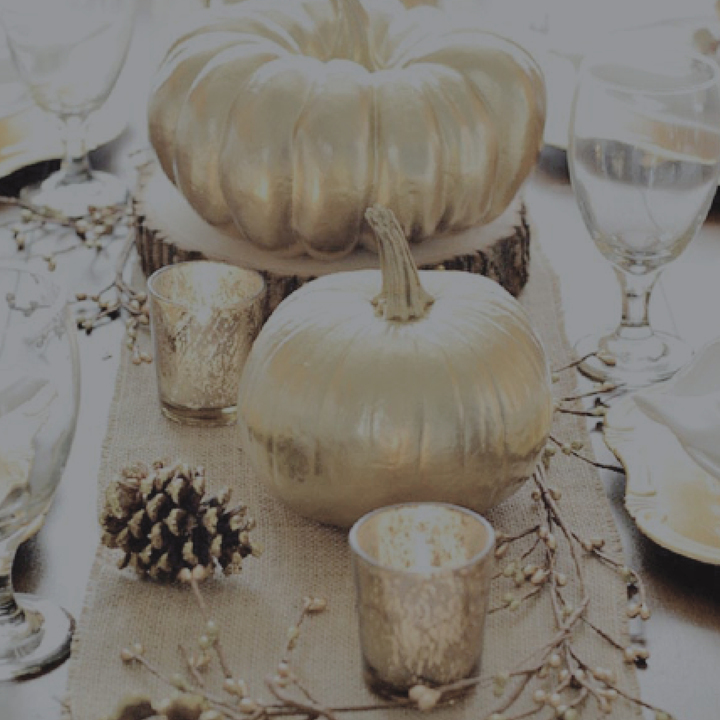 2) Metallic Table Runner: Infuse your table with holiday glitter by adding a touch of class with gold. Start with adding some natural texture with a stunning burlap table runner. Decorate with pumpkins, branches and pinecones (all spray-painted gold), creating a modern and fresh aesthetic with rustic nuances. 3) Decorative Table: Add natural touches to your holiday table decor with bittersweet, leaves and gourds. Begin with a wooden plank in the center of your table, add pillar candles in fall-inspired hues or scented candles of pumpkin spice, apple pie, cinnamon, vanilla, etc. Encircle the centerpiece with gourds, dried berries and vines. Add place settings in fall colors, topped with linen napkins wrapped with ribbon and dried leaves. 4) Leafy Centerpiece: Fill a glass jar with fall turned leaves to create an inexpensive centerpiece for your table. 5) Fill a Glass Vase: with dried peas, red kidney beans and corn kernels for a fresh and innovative display. Top with a candle in a harvest color and tie a fresh piece of twine into a ribbon for a finished effect that is very natural. 6) String leaves together and hang them from your chandelier above your dining table for an interesting visual effect. 7) Fill a tray with fall items such as pinecones, potpourri with a harvest scent, pillar candles and a vase filled with flowers or dried leaves. This can easily be moved out of the way if additional space is needed and can be easily changed if you have a new idea! 8) Fill a pumpkin with fresh fall-inspired flowers such as mums and berries. 9) Non-Traditional Centerpice: Create a non-traditional holiday display with some festive bright pops of color in pink. Paint pumpkins in various shades of pink and a metallic gold for some contrast. Hollow out the insides to add fresh flowers and paint the stems of the pink pumpkins in glitter gold. Display your pumpkins on candle holders of various heights. 10) Twig Table Runner: Add organic materials to your table with a stunning table runner comprised of twigs. Gather twigs from your yard or purchase them from a craft store. Love these DYI table settings and tips? Visit http://bit.ly/2y0I4vZ for Onekindesign’s full list of 47 fabulous DIY idea for Thanksgiving table décor. With this occasion, we’re reminded that there is always something to be grateful for, and today we encourage you to stop and give thanks for small things, big things and everything in between. We are wishing you all a very Happy Thanksgiving! We appreciate you.